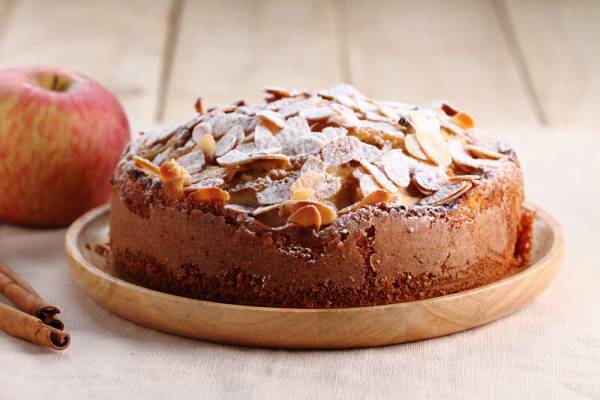 Soft, caramelised apples topped with a Calvados cream and homemade almond nougatine. Apple and pecan nuts cooked in a home made caramel and served with a crunchy almond topping. Apples and pears cooked in caramel and served with an almond crumble topping. 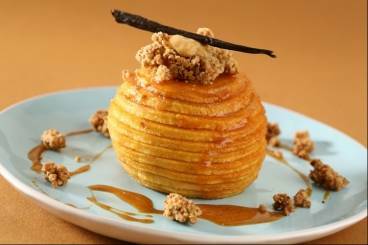 Slow roasted apples in a salter butter caramel sauce served with almond nougatine. 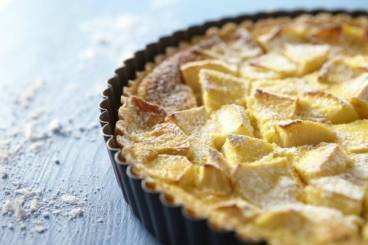 A classic Normandy recipe for apple tart served with thick creme fraiche. 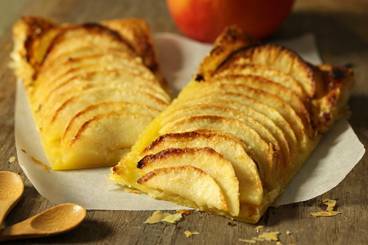 A super simple and very quick recipe for apple tart made with just four ingredients; puff pastry, apples, butter and sugar. Very easy and very tasty! Vanilla sablé biscuits topped with caramelised apples flambéed in Calvados and served with a quenelle of fromage blanc mousse and fresh apple slices. Whole apples oven baked in a lightly salted caramel.